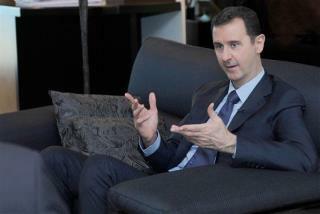 (Newser) – That Bashar al-Assad sure is a kidder. When asked today to comment on the Nobel Peace Prize—which was awarded to the UN group currently working to dismantle his chemical weapons arsenal—the Syrian ruler quipped that it "should have been mine," the AFP reports. The comment came in an interview with a pro-Syrian Lebanese newspaper, which wrote that he said it "jokingly." Get it? The joke is that Assad is a war criminal. Gunmen abducted seven Red Cross and Red Crescent aid workers yesterday as they attempted to deliver medical supplies in Idlib province. Three were released unharmed today, but it's unclear where the rest might be, or who might have them, CNN reports. At least 20 people, including one child, were killed by a car bomb in the Idlib town of Darkush. Syrian and Red Crescent officials have evacuated some 3,000 civilians from the Damascus suburb of Muadhamiya, which the government says is being "held hostage by terrorists," the LA Times reports. Both sides have accused each other of blocking humanitarian aid from Muadhamiya, and the Syrian Observatory for Human Rights says the evacuation was "a result of days of negotiations." The only thing Assad should get is shot! assend is right! if obomber got one anyone can. assend can use the money for more guns and ammo!